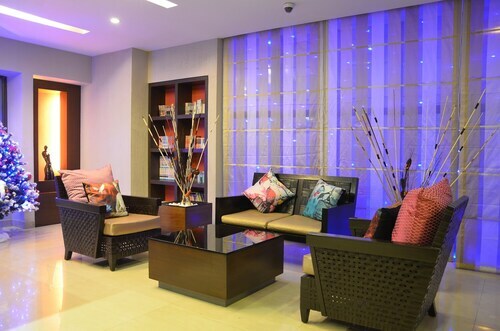 Located in Mylapore, this spa hotel is within 1 mi (2 km) of Music Academy, Consulate General of the United States, Chennai, and Chennai Citi Center Mall. Marina Beach and Kapaleeswarar Temple are also within 2 mi (3 km). Chennai Thirumayilai Station is 22 minutes by foot and Chennai Light House Station is 24 minutes. 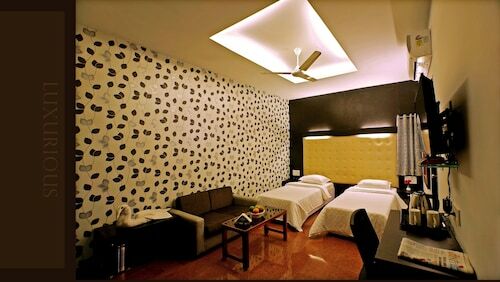 Located in Mylapore, this hotel is within a 10-minute walk of San Thome Cathedral and Marina Beach. Chennai Citi Center Mall and Kapaleeswarar Temple are also within 15 minutes. Chennai Light House Station is 17 minutes by foot and Chennai Thirumayilai Station is 18 minutes. 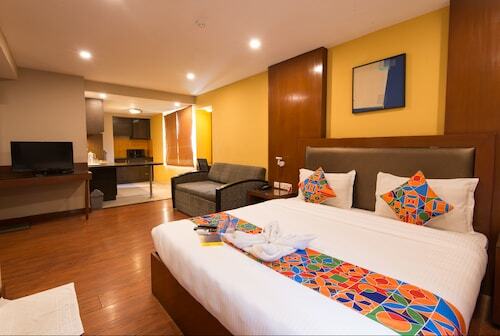 Located in Mylapore Tiruvallikk, this hotel is within a 10-minute walk of San Thome Cathedral and Marina Beach. Chennai Citi Center Mall and Kapaleeswarar Temple are also within 1 mi (2 km). Chennai Light House Station is 17 minutes by foot and Chennai Thirumayilai Station is 19 minutes. 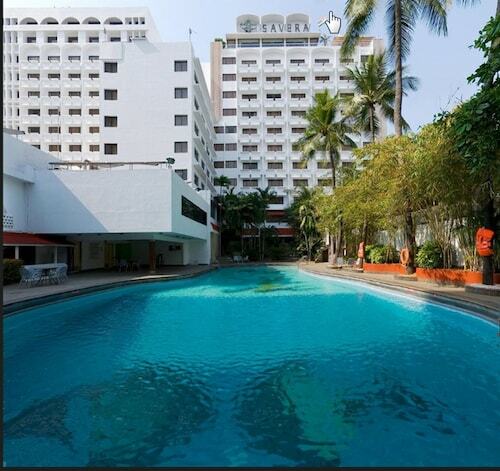 Located in Mylapore Tiruvallikk, this golf hotel is within a 10-minute walk of San Thome Cathedral and Marina Beach. Chennai Citi Center Mall and Kapaleeswarar Temple are also within 1 mi (2 km). Chennai Light House Station is 17 minutes by foot and Chennai Thirumayilai Station is 19 minutes. 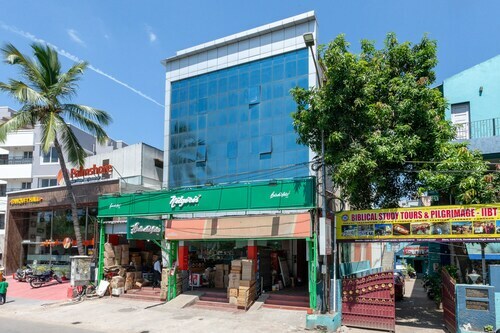 Located in T Nagar, this luxury hotel is 1.1 mi (1.7 km) from Consulate General of the United States, Chennai and within 3 mi (5 km) of Kapaleeswarar Temple and Chennai Citi Center Mall. Marina Beach and Fort St. George are also within 6 mi (10 km). Chennai Mambalam Station is 28 minutes by foot and Chennai Kodambakkam Station is 30 minutes. Located in Mylapore, this hotel is within a 15-minute walk of San Thome Cathedral and Kapaleeswarar Temple. Marina Beach and Chennai Citi Center Mall are also within 1 mi (2 km). Chennai Thirumayilai Station is 19 minutes by foot and Chennai Mandavelli Station is 23 minutes. Located in Mylapore Tiruvallikk, this spa hotel is within a 15-minute walk of San Thome Cathedral and Kapaleeswarar Temple. Marina Beach and Chennai Citi Center Mall are also within 1 mi (2 km). Chennai Thirumayilai Station is 21 minutes by foot and Chennai Mandavelli Station is 25 minutes. 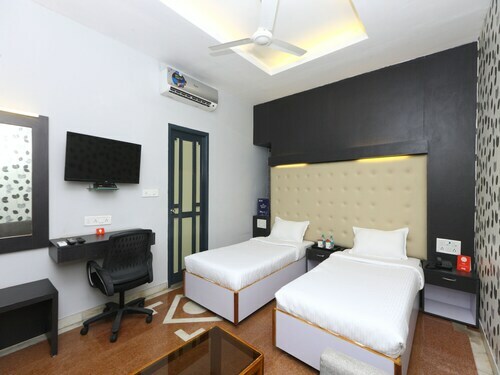 This family-friendly Chennai aparthotel is located in the business district, within 2 mi (3 km) of Kapaleeswarar Temple and San Thome Cathedral. Marina Beach and Chennai Citi Center Mall are also within 3 mi (5 km). Chennai Mandavelli Station is 26 minutes by foot and Chennai Greenways Road Station is 28 minutes. 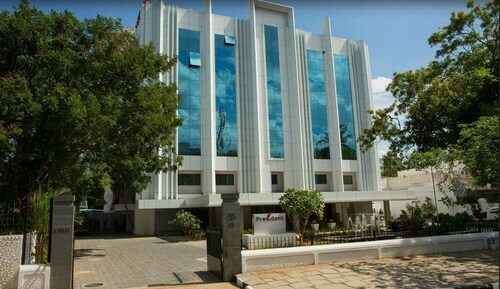 Located in Mylapore, this hotel is within 1 mi (2 km) of Music Academy, Marina Beach, and Chennai Citi Center Mall. Consulate General of the United States, Chennai and Kapaleeswarar Temple are also within 2 mi (3 km). Chennai Light House Station is 10 minutes by foot and Chennai Thirumayilai Station is 18 minutes. San Thome Cathedral, an attraction of sacred significance, is the perfect place to learn about the local faith and culture. 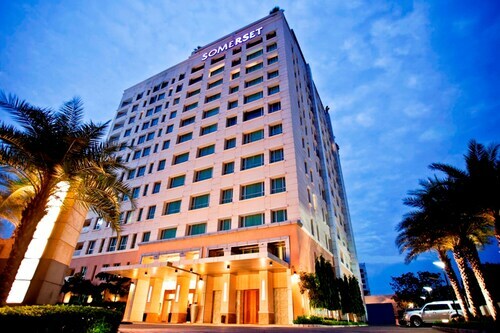 It's located in Chennai, a well-loved city that beckons travelers from all over the world. Since you'll be spending a large portion of your time at San Thome Cathedral, why don't you get a room within an easy commute? With 26 nearby possibilities, you will be able to discover something perfect. 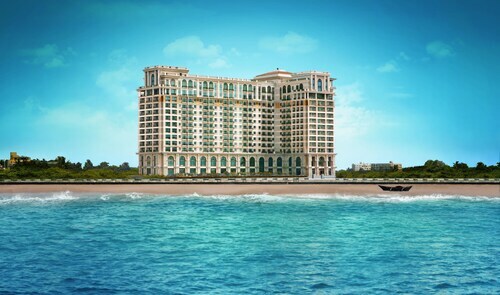 The Leela Palace Chennai is only 1 mile (2 kilometers) away. If that's not what you're looking for, the Somerset Greenways Chennai and The Raintree, St. Mary's Road are located 1 mile (2 kilometers) and 2 miles (3 kilometers) away, respectively. 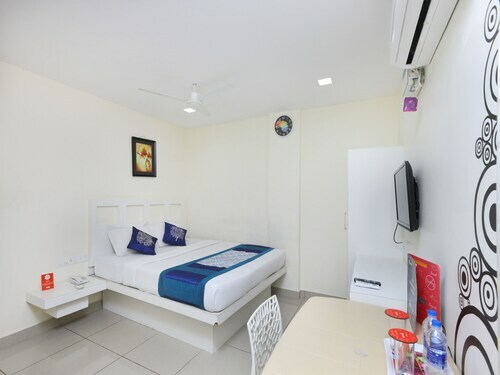 At the Sangeetha Residency, which is just 0.8 miles (1.3 kilometers) away, you'll be able to sleep soundly, safe in the knowledge that you've scored the most affordable deal in town. If you’re seeking someplace stylish to rest your head, you can investigate the few premier hotels close by. 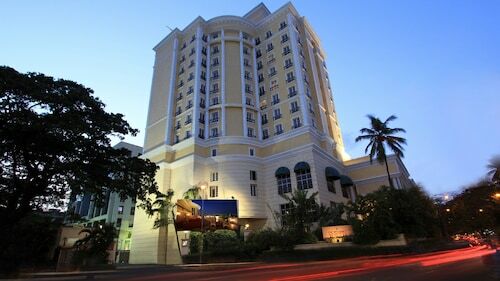 Travelers often head down to the Clarion Hotel Chennai, a mere 0.9 miles (1.4 kilometers) away. Otherwise, you could book a few nights at the Hotel Savera, located 1 mile (2 kilometers) away. Cafe ambience and culture varies so much around the world. Order a coffee from Bike Parked, a brief stroll from San Thome Cathedral, and enjoy the little differences! If your stomach is still making a fuss, check out the food at Rasi Shopping Centre, a great eatery nearby. Tourists looking for a beer or vino ought to swing by Sri Maha Cool Bar, another brief walk down the street. An important house of worship in the region is Santhome Basilica. Look at its beautiful façade or see if you are able to go inside. Santhome Cathedral Basilica is a notable cathedral that is definitely worth checking out. Arrange for a visit to Kamakshi Amman Temple, a serene place of worship. Enjoy the remarkably serene and spiritual atmosphere surrounding Kapaleeswarar Temple. Admiring the architecture of Kapaleeswar Temple chennai and learning all about the landmark's significant history is a popular excursion. If you're after a convenient way to see San Thome Cathedral, all you need to do is jump on the train to Mundakanni Amman Kovil, 0.7 miles (1.1 kilometer) away. How Much is a Hotel Room in San Thome Cathedral? Hotels in San Thome Cathedral start at $17 per night. Prices and availability subject to change. Additional terms may apply.